Bird migration is an impressive phenomenon, but why birds often travel huge distances to and from their breeding grounds in the far North is still very unclear. Suggestions include that the birds profit from longer daylight hours, or that there are fewer predators. Researchers from the University of Groningen and the NIOO-KNAW Vogeltrekstation, the Dutch centre for bird migration and demographics, have discovered a new explanation. 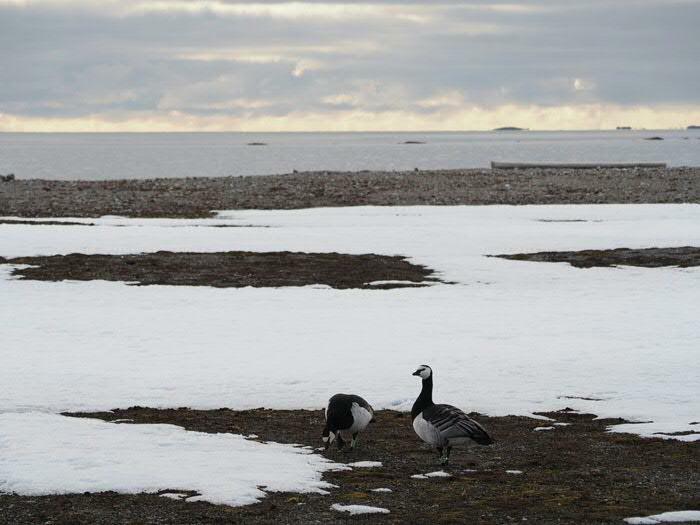 They investigated barnacle geese breeding on Spitsbergen and compared them with birds of the same species that did not migrate but stayed in the Netherlands all year round. The birds on Spitsbergen appear to invest much less energy in their immune systems, particularly the part responsible for general resistance to disease. The researchers suspect that this might be because there are far fewer pathogens in the North than here in the Netherlands. By investing less in their immune systems, the birds have more energy available for reproduction and changing their plumage. The birds that breed in the Netherlands do not have this luxury. In order to defend themselves against pathogens like bird flu, their immune systems work about four times as hard during the entire summer than those of the same species in the North. Thus birds appear able to adjust their immune systems according to the risk of catching a disease.